How does one write the perfect best man speech? The folks over at United Kingdom-based online wedding resource, The Wedding Secret, recently put together an article titled "How to Write the Perfect Best Man Speech". The piece does a great job in providing tips on - drum roll please - how to write the perfect best man speech. So if you've decided to write your speech solo, make sure to check out that article by The Wedding Secret to gather pointers, help boost your confidence, and ensure you write the perfect best man speech. However, if after reading the article you become overwhelmed, we'll be here waiting for you with open arms. Most know that The Knot is a premiere destination for wedding everything. So imagine our high-in-the-clouds delight when they chose us, Best Man Speech Writer, as one of 7 wedding concierge services brides and grooms should call upon for their wedding. This all happened late last year and that feature on their website (here) helped make our 2015 extra great. Well, The Knot seems to want to make our 2016 extra great too because they featured us again. AGAIN! And this time it is in their Texas Weddings Magazine Fall/Winter 2016 issue. Pick up your copy today and check us out on page 440. Thank you again to the team at The Knot for recognizing wedding concierge service providers and for including us - we are honored. Survey finds groomsmen spend more than bridesmaids, and breaks down differences by wedding expense categories. Cupid's busiest work day is popular for proposals so you may be getting a call to be someone's best man soon! 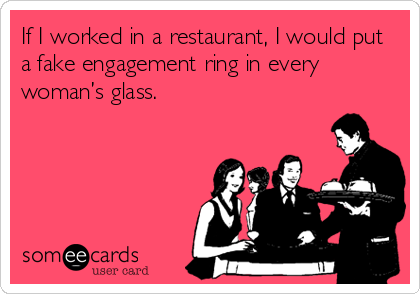 Until then, enjoy someecard.com's work below and join us our laughing out loud.